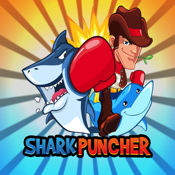 Shark Puncher is an arcade-style racing game where you can race against the clock or against your friends to punch the most sharks. But be careful! Squid-ink, land-mines, and trash will make it tough to swim without any issues! Join Hunter, the rough and tough cowboy, and Flo, the bubbly dolphin, to stop Rex the evil Shark from cloning himself and taking over the oceans! Customize your cowboy and dolphin to fight through endless sharks on three exciting maps! SharkPuncher is also a proud partner of Plan International USA. A portion of our proceeds will provide malaria treatment and prevention education to communities where Plan International operates, starting in Togo.